On Monday, a trio of researchers from the San Francisco Fed released an economic letter pondering what was different about the latest housing boom. The reason they’re asking this question is because home prices are now nearly back to their pre-recession peak. Uh oh? In some states, they’re actually higher, but I suppose nationally they’re still below. Obviously this has some folks worried we could be in for another housing crisis seeing that the peak prices seemed ridiculous back in 2006, less than 10 years ago. The good news, in their eyes, is that this time things are different. Famous last words? Probably, but let them tell you why. Basically, home prices kept climbing and credit kept loosening to keep up. So you had home prices that were out of reach that could only be purchased with increasingly flexible financing terms. So we saw zero down mortgages, stated income mortgages, option arms, which allowed borrowers to make a negative amortization payment, and other exotic loan features. Of course it all came crashing down, but we were able to bounce back over the past decade thanks to reduced housing inventory, super low mortgage rates, better underwriting, and so on. The researchers claim it’s a lot different this time around because there’s a “less-pronounced increase in housing valuation” coupled with a decline in household leverage. In other words, home prices haven’t risen as much relative to rents, which are skyrocketing, and those who do buy homes are putting more money down and taking on healthier monthly payments. While there are zero down options kicking around, most new homeowners put down more money when buying these days. Interestingly, even though there are low-down payment options, such as FHA loans, which require just 3.5% down, or the new Fannie/Freddie 3% down option, the market might actually demand higher. You see, it’s hard to get your offer accepted these days, so coming to the negotiating table with your 3% or 3.5% down payment might not get much notice. Instead, the sellers might favor the buyer willing to put down 10% or 20%. Additionally, even though there are low-down payments programs available, borrowers actually need to qualify these days. You can’t just say you make $10,000 a month working the drive through window anymore. Yes, that probably happened a lot in 2006. It seems they know themselves that it’s foolish to think like this, though they go on to talk about how things appear a lot better than prior to the earlier crash. For instance, the home price-to-rent ratio reached an all-time high in early 2006, but currently sits about 25% below the bubble peak. You can partially thank surging rents for that. Front-end DTI ratios (housing payments relative to income) also hit an all-time high in late 2007, meaning homeowners were highly leveraged at a time when home prices were topping out. Now things get interesting. 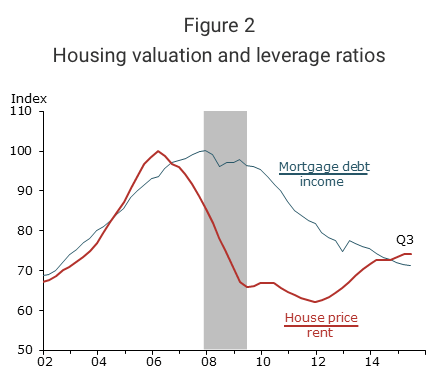 While it’s great that this latest boom has kept home prices in check relative to rents, and household mortgage debt isn’t completely out of control, it doesn’t mean we’re good to go. I’m sure there was a time during the prior boom (and other booms for that matter) when everything looked peachy. Then a few short years later, we’re all asking ourselves how this could have happened again. But will they? We recently introduced 3% down payments and Fannie and Freddie are pushing lenders to offer the product more to cash strapped borrowers. There’s also chatter about another FHA premium cut to spur lending as if anyone is holding back for that reason at the moment. In fact, some parts of the country won’t be affordable for a full 30 years to some prospective home buyers. And how exactly will we unload all these pricey homes in the next several years, especially if mortgage rates go up, as they’re projected to? Perhaps raising acceptable LTVs again will be the answer. Or maybe non-QM lending will finally get legs with some new form of fancy stated income underwriting. I don’t know, but it sure feels like we’re headed down the very same path we just got off a few years ago. But maybe this just isn’t your father’s (or mother’s) housing market any longer. Gone are the days of 20% down payments, a mortgage that is held by your local bank, and slow but steady appreciation. Today, it’s rampant speculation, hedge funds, booms and busts followed by more booms and busts, perhaps because real estate has become such an investment obsession as opposed to a place to lay your head. Just make sure you know when to get in and out.